The Indianapolis Colts today signed guard David Arkin to the practice squad and released tight end Sean McGrath from the practice squad. Arkin, 6-5, 310 pounds, spent one week on the Colts practice squad before being released on September 23. He has played in one regular season game and three postseason contests with the Colts and Miami Dolphins. In 2014, Arkin spent the majority of the season on the Colts practice squad before being signed to the active roster and competing in all three of Indianapolis’ postseason games on special teams and in tackle-eligible situations. He was originally selected by the Cowboys in the fourth round (110th overall) of the 2011 NFL Draft and spent time on the Cowboys and Seattle Seahawks practice squads. McGrath, 6-5, 259 pounds, was signed to the Colts practice squad on October 21. He previously spent two weeks on the Colts practice squad before being released on October 5. He has played in 18 games (nine starts) over his NFL career and has caught 26 passes for 302 yards (11.6 avg.) and two touchdowns. INDIANAPOLIS – The Colts dropped their second straight home game on Sunday afternoon in a 27-21 loss to the Saints. Despite the on-the-field problems against New Orleans, the Colts did maintain their one-game lead in the AFC South through seen weeks. Next up for the Colts is a trip to Carolina (6-0) on Monday Night Football. FIRST-HALF MISUCES – Things began to unravel on Sunday for the Colts following a fake field-goal down to the one-yard line late in the first quarter. That started a run of 20 Saints points in 3:55, leading to Chuck Pagano calling the first half “unacceptable” in his post-game press conference. The comeback was impressive, but the play in the first half was not. MORE OFFENSIVE CONSISTENCY – The Colts offense did not see their first first-down of the game until the 13-minute mark of the second quarter. The lack of rhythm for the Colts offense, along with costly turnovers forced the defense into some very short fields. DORSETT INJURY WATCH– Colts first-round pick Phillip Dorsett exited Sunday with a lower leg injury in the second quarter. Reports have Dorsett missing four-to-six weeks with an ankle injury. If Dorsett does indeed miss that chunk, the burden will fall on the shoulders of Donte Moncrief and Andre Johnson to complement T.Y. Hilton. MCAFEE’S ALL-PRO DAY – It’s not a good thing when Pat McAfee punts 10 times in a game. However, McAfee made the most his duties on Sunday. McAfee averaged 51.7 yards per punt and extended his league-leading net average of 46.7. McAfee also has registered touchbacks on 96 percent of his touchbacks this season, which also leads the NFL. UNDEFEATEDS COMING – At 3-4, the Colts still have a one-game lead in the AFC South. The schedule does not ease up at all though for Indianapolis. They will travel to Carolina (6-0) next Monday, before returning home to play Denver (6-0) the week after. Then after the Colts by week, they will hit the road again to take on a 6-1 Atlanta team. This week’s “Back-Up of the Game” presented by Venyu is safety Colt Anderson. With Mike Adams out on Sunday due to a hamstring injury and Clayton Geathers also sidelined (knee sprain), Anderson was thrust into starting duty. 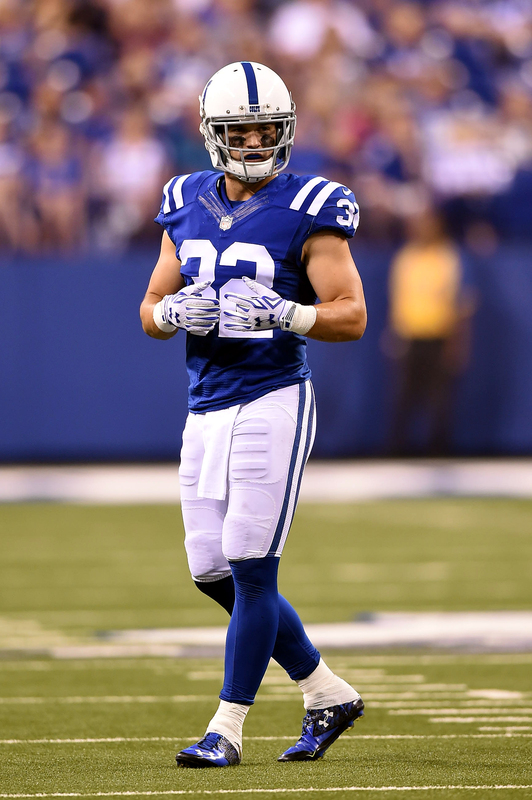 Colt Anderson finished Sunday with four total tackles in playing 84 of the team’s 88 defensive snaps. Throw in Anderson’s special teams role of playing 29 snaps and the veteran safety saw the most playing time of any Colts player on Sunday. The one play Anderson would definitely love to have back on Sunday came in an onside kick attempt with three minutes left. It looked as if a diving Anderson had the onside kick in his grasp for a split second before the ball bounded away for the Saints to recover. From the sound of it, Anderson will likely be back in his primary role of special teams captain next week. Adams told the FOX broadcast crew that he will return to the field next Monday night when the Colts (3-4) travel to Carolina (6-0).